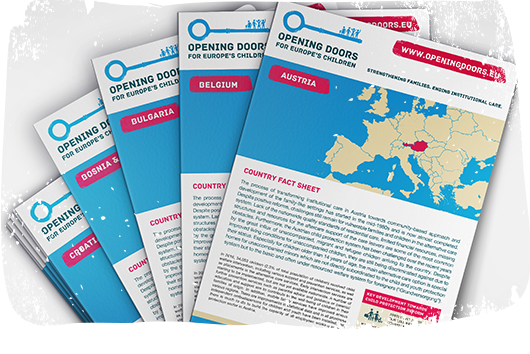 The Opening Doors for Europe’s Children – a pan-European campaign advocating for strengthening families and ending institutional care – released the 2017 country fact sheets which document steady progress towards deinstitutionalisation (DI) in 16 European countries. However, policy commitments and money should be channelled more efficiently into families and communities, and not institutions, country snapshots reveal. Through recommendations addressed to the European Union and national governments, the campaign bridges evidence with further actions to ensure sustainability of reforms, effective use of funds and better outcomes for more children. The evidence from the Opening Doors countries demonstrates that in 2017, important steps have been achieved to remove financial barriers that support deinstitutionalisation. The European Structural and Investment Funds (ESIF) which keep deinstitutionalisation as one of the funding priorities have started being used in the EU Member States. In Bulgaria, over €160 million have been allocated for deinstitutionalisation reforms through European Structural Investment Funds. Romania has allocated over €100 million through the EU Structural Funds to close 50 old-type institutions for children. With the help of ESF, in 2018, support services for foster carers will be developed in Latvia and over €90 million of total allocations will contribute towards deinstitutionalisation reform through ESF and ERDF. In May 2017, five calls for proposals financed by the European Social Fund were launched to support deinstitutionalisation and strengthening of families in Croatia. In 2017, the Instrument of Pre Accession Funding 2013 was released with approximately €1,5 million allocated for deinstitutionalisation of children and adults in Serbia. However, in Hungary, under two calls for proposals in 2017, European Structural funds are planned to be used for the renovation of residential care settings and for modernisation of children’s homes. In Poland, it is of worry that guidelines on the use of EU funds permit ESIF funding to be used on the institutions that house up to 14 children in one setting. Although ESIF funds for deinstitutionalisation reforms have been allocated in Greece, they still have not been spent due to the lack of a national deinstitutionalisation strategy. In 2017, many countries continued with setting legislative and political grounds necessary to achieve the transition from institutional to family and community-based care in a systemic way. Bosnia and Herzegovina progressed towards deinstitutionalisation by developing legislation: after adopting Law on Foster Care in February 2017, it is now working on the Law on Social Services, Law on Protection of Families with Children and Law on Social Work. Joint discussions to work on the development of a deinstitutionalisation strategy for all groups of people in vulnerable situations took place in Spain. The Government of Ukraine adopted the National DI Strategy and the Action Plan for 2017-2026. In Romania, the National Action Plan for the realisation of the National DI Strategy was adopted at the end of 2017. However, in Belgium, Hungary and Poland there is no strategy or action plan for children’s deinstitutionalisation. Although in Serbia the Prime Minister announced the priority for deinstitutionalisation reforms, until today, there has not been a consolidated law on child protection and the rights of the child adopted or considered yet; furthermore, there is no clear and established deinstitutionalisation strategy or Master Plan for the transformation of institutions for children. Achieving transition requires integrated approach in a number of policy areas which have been often addressed in a fragmented way across Europe: poverty and social inclusion, disability, ethnic minorities, children rights and family support. Children remain at a greater risk if there is insufficient oversight of the quality of care. For example, an increasing proportion of children placed in foster care in the majority of participating countries can be seen as a positive development. However, if foster parents are not adequately trained, supported and monitored, the quality of care may not, in fact, be improved. The same applies to small group homes based in the community. They are usually better adapted to provide individualised care, but sometimes due to inadequate resourcing or staff training, they function as small institutions. In Poland, Hungary, Estonia or Bulgaria, for instance, deinstitutionalisation has meant splitting large residential facilities into smaller units. However, this doesn’t necessarily imply an improvement in the quality of care, if the overall institutional culture remains intact. When proceeding to deinstitutionalisation reforms, governments must also commit to qualitative measures. A considerable number of children are still entering public care prematurely, which harms children for life and contravenes best practice and international norms (e.g. BiH, Moldova, Ukraine). Rates of family separation are high, and the main causes of children’s placement in institutional care are poverty, disability, migration or ethnic origin. In Greece and Hungary, child poverty is on the rise, with investment in social services lagging behind. There is a general lack of action on institutional care for babies and young children. Although legal provisions exist to prevent children under three being placed in institutions, the lack of alternative care options in practice means children under 3 continue to be placed in institutional care or hospitals. To ring-fence funds from the national budgets to ensure sustainability of EU-funded interventions after the end of the funding period. To continue implementation of deinstitutionalisation as a complex process (not only closing institutions) including prevention, social work with families with children, development of community-based services, improved support system for out-of-family care and services for leaving care. For a comprehensive picture of the situation with deinstitutionalisation on the ground, check out the full list of country factsheets available here. The 16 country fact sheets were compiled by: FICE Austria, FICE Croatia, FICE Spain, La Port Ouverte and ENIL in Belgium, Hope and Homes for Children in Bosnia and Herzegovina, Romania, Moldova and Ukraine, National Network for Children in Bulgaria, Igale Lapsele Pere in Estonia, Roots Research Center in Greece, Family Child Youth Association in Hungary, SOS Children’s Villages in Latvia and Lithuania, Child and Family Foundation in Poland and MODS in Serbia. They are updated by the National Coordinators of the Opening Doors campaign on an annual basis and are primarily sourced from the official state sources. For earlier versions please check 2016, 2015 and 2014 factsheets.